Don't know what to get that special someone? Get them a ShopRuger eGift Certificate! It's the gift that always fits. Enter the intended recipient's name and any special notation in the text boxes above. This information will be displayed on the eGift Certificate. The eGift Certificate will be emailed to the email address listed in the "Shipping Address" section of the Checkout page. If buying for someone else, your name will be identified as the purchaser in the email that is sent to the recipient. Reminder, eGift Certificates are emailed gift certificates only. A hard copy, physical version, will NOT be mailed, nor is one available. 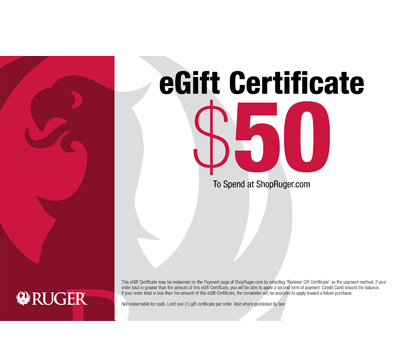 The eGift Certificate code may be redeemed on the Payment page of ShopRuger.com by selecting "Redeem Gift Certificate" as the payment method. If your order total is greater than the amount of this eGift Certificate, you will be able to apply a second form of payment (Credit Card) toward the balance. If your order total is less than the amount of this eGift Certificate, the remainder will be available to apply toward a future purchase. Not redeemable for cash. Limit one (1) gift certificate per order. Void where prohibited by law. Expires January 1, 2022.